Getting married is the biggest day of your life. And it will probably be the 16th biggest day of your best man’s life too, ranking somewhere behind getting the keys to your first home, that Tinder date that went unexpectedly well, and the day your team won the Champions League. But your best man has been there for your highs and your lows. He was there when you were gushing about meeting the love of your life, he was there when you were inconsolable after sending that ‘risky’ text after the first date that didn’t get an immediate response. He was there when you got that promotion at work that you’d spent years fighting for, he was there when you accidentally sent that NSFW meme as a global on your first day in the new role. He’s been there through everything. He is, after all, your best man. T3 Roundups are product guides where we've chosen the products based on our research. Usually we'll also only include a product in one of these 'best' lists if they're highly rated by users and/or appear in the best-seller lists at major retailers such as Amazon, Argos or John Lewis. Best man gifts aren’t expected, having not quite joined novelty cuff-links and awkward speeches as iron-clad wedding traditions yet. But it’s nice to reward your right-hand man and other significant other, by showing you’ve thought of him as someone more than the person to do the behind-the-scenes organising on the day itself. Here are the best, er, best man gifts you can buy. Yes, we know. You’ll have looked at the price and felt your heart miss a beat in shock. Aspinal of London has made its name through making luxury leather goods. This wallet, despite being on the lower end of their price scale, drips with that same quality and class found in all of their products. You can customise it to be the colour you want, adding different textures to the inside and out of, and you can personalise it too. So you can give your best man the gift of a lifetime that reads “thanks for not vomiting in my shoes 20.4.17” on the exterior. If you’re stuck between buying your best man a hip flask, cufflinks or wedding socks as a gift – a situation we’ve all found ourselves in at some point – then good news! Metal Moments has put together a gift box containing all three. The hip flask is the crown jewel in this treasure trove of gifts, thanks to its matt black finish and personalised message. The cufflinks and wedding socks both have ‘best man’ emblazoned across them, making them more one-off items for the day than something that can be used with pride again and again, but this is still an excellent package for your best man that saves you having to make another difficult decision ahead of the big day itself. Your firm friendship with your best man might demand a gift that’s a cut above the rest. Perhaps your friendship was formed over bottomless brunches and ISA stock discussions, rather than vomiting around the back of Tiger Tiger at 2am while shouting “I’m fine, just give me a second”. For the classy best man who demands a classy gift comes this classy option – an engraved mother of pearl pocket watch. The biggest surprise here is that for the quality and class on display, the price won’t make you weep. It’s very, very reasonable for what you’re getting here, which is a pocket watch of the upmost style and sophistication. Buying your best man alcohol might feel like a cop-out but this isn’t exactly the same as slinging a six-pack of Stella in a Sainsbury’s carrier bag his way. Where this malt whiskey shines is the personalised label. It has the name in big, bold font and it somehow feels special, despite the message being printed on the label rather than needing something as fancy as laser-engraving. Bonus points for the customisation options too. 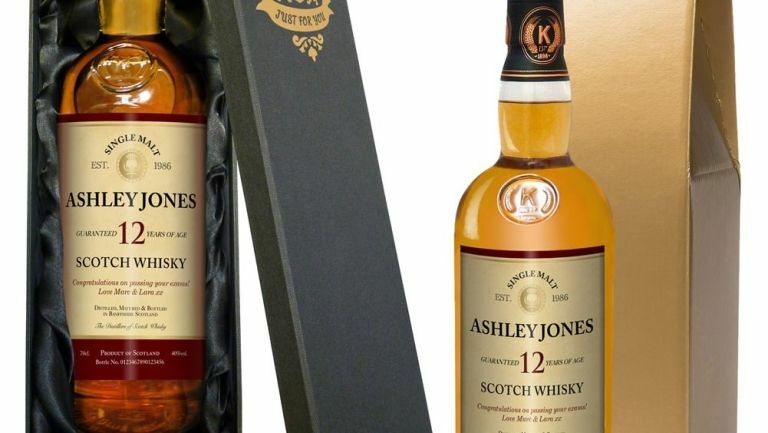 You can choose between 12-year-old malt whiskey or single malt whiskey, while you can also decide between a gold gift carton or silk-lined box for the packaging. Personalised malt whiskey is the failsafe option as far as best man gifts go. He’s bound to love it. Unless he’s tee-total, of course. And the wedding itself could change that. “Looks good,” says Babs from Preston. “Good quality,” says Loni from Manchester. “Glass,” says the enigmatic and monosyllabic caz43 from Scotland. With reviews like that, how can you say no to this engraved whiskey glass? You can personalise it with your own message (though the limit is 88 characters, so you can’t fit your best ever tweet on there) and it has a glass dimple base to help it stand out. There’s not much else to say really – it’s an engraved glass, it’s good quality, it looks good and it does its job perfectly well. “A great present,” says Ryan King.